Get with the new way of doing things when you advertise on the Contemporary 8 1/2" x 11" Zippered Portfolio! It is made of PVC and features an outside zipper for security. 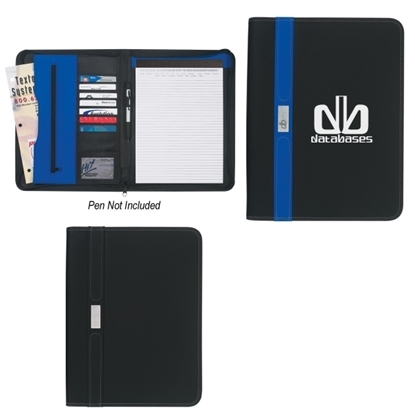 It also includes a 30 page 8 1/2" x 11" writing pad, eight card holders, an elastic pen loop, three interior pockets (one with a zipper) and a mesh ID holder. No pen is included with this item. With all of those features, the recipients are sure to be overjoyed at such a great promotional item. Silkscreen your company information onto it so your clients know what company values their time! This black leather look zippered portfolio includes a calculator, 30 page writing pad, elastic pen loop, card holders and a mesh ID holder. It also has three interior pockets: one with a zipper and one is expandable. There is an outside zipper for added security. A great desk accessory for school or for the office, you can customize this item by adding an imprint of your company name or logo. 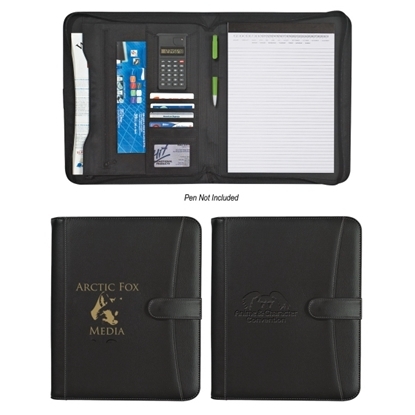 Use this 8 1/2" x 11" portfolio as a corporate gift or promotional giveaway! A handy organizational tool for the office, this black pebble grain zippered portfolio includes a calculator, 30 page writing pad (8 1/2" x 11), 4 card holders, an elastic pen loop, 3 interior pockets (one with zipper) and a mesh ID holder. It also has an outside front pocket with a snap closure and an outside zipper for added security. The pen is not included. Add a custom imprint of your logo and use this portfolio as a corporate gift or promotional giveaway! Be prepared for your next meeting! 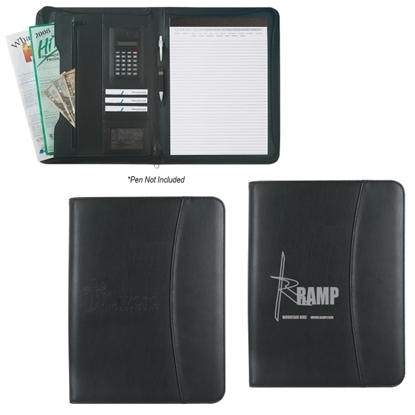 This bonded leather zipper portfolio includes a 30 page 8 1/2" x 11" writing pad, calculator, elastic pen loop, card holders, a mesh ID holder and three interior pockets: one with a zipper and one is expandable. There is an outside zipper for added security. The pen is not included. 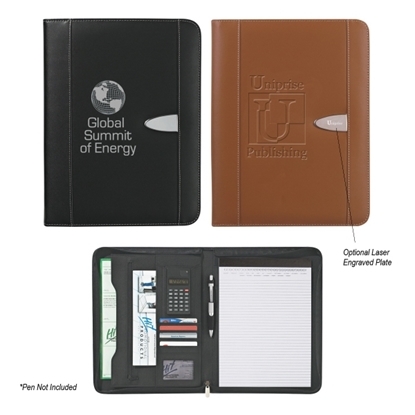 Offered in black or brown, add a custom imprint of your logo and use this portfolio as a corporate gift or promotional giveaway! Mypromotionalpens.com offers the largest and best priced selection in Promotional Portfolios. We will price compete and we won't be under sold. Let our graphic designers make your personalized Portfolios standout above the crowd at no charge. We won't stop until you are completely satisfied with your custom Portfolios art proof.Use category search filters on your left to help narrow your search to find exactly what you are looking for.